Learn how to use the fastest, smartest, easiest way to write music. We are pleased to announce the launch of the new Sibelius Feedback Community on IdeaScale. 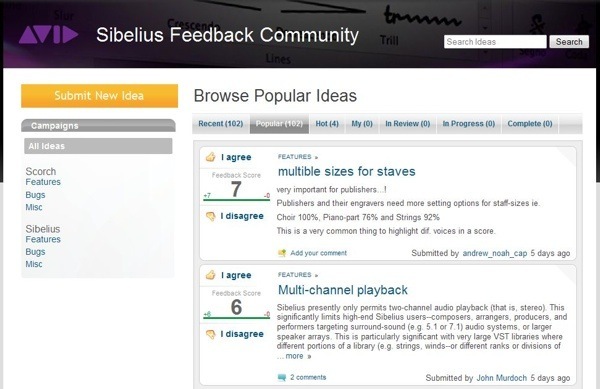 Open to all Sibelius customers, the feedback community is a great way to collaborate, share, and discuss feature development ideas for Sibelius and Scorch notation software. Getting started with IdeaScale is easy. You can browse the currently submitted ideas without an account, and when you’re ready to participate, log in with a valid email account or a social media profile. Similar to the Pro Tools Feedback Community, the notation software development team at Avid looks forward to bringing some of the top recommended feature from the Sibelius Feedback Community into future Sibelius and Scorch software releases. With 102 ideas already submitted as of this writing, the community is off to a great start! If you’re a music educator headed to this year’s Winter NAMM show, come join for us a sneak peek into our recently launched Sibelius Training and Certification Program, and find out why Sibelius 7 is the fastest, smartest, easiest way to write music. Don’t miss the opportunity to learn firsthand from Sibelius experts about the ins and outs of Sibelius software. You will even take home a complimentary copy of Sibelius First software. During the session, master instructor Jenny Amaya will offer interactive learning based on our industry-leading Learning Partner courseware. You’ll get an overview of the solution, along with examples of the introductory, intermediate, and advanced curricula. Whether you’re a music educator who’s totally new to Sibelius, a Sibelius aficionado preparing to teach the software to others, or an Avid Certified Instructor hoping to explore a new market, we’ll make sure to address all of your questions and give you what you need to incorporate the software into your own curriculum in a way that’s most valuable to your students. With flexible licensing for institutions and built-in classroom management features, Sibelius is the ideal solution for your classroom or lab. In addition, your students will receive four years of complimentary upgrades, so they can stay up to date throughout the course of their studies. Advanced registration is highly recommended, but you are also welcome to just swing by the Hilton Anaheim in the San Clemente Room, where we’ll be holding training sessions at 11 a.m., 1 p.m., and 3p.m. 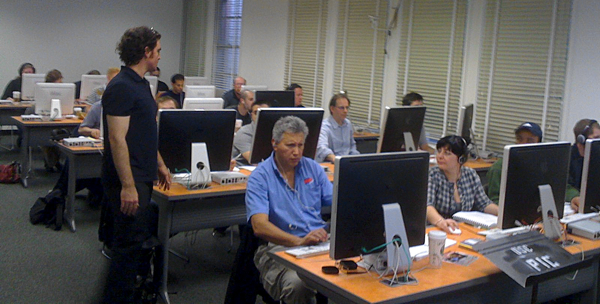 PT from Friday, January 25th through Sunday, January 27th during NAMM’s Music Educator Days. PS: Can’t attend but want to learn more about Sibelius 7 for Education? From worksheet creator to easy classroom control—check out all our classroom features.